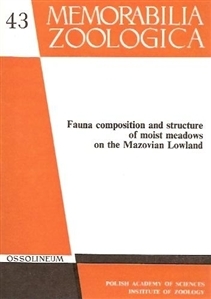 Fauna composition and structure of moist meadows on the Mazovian Lowland. 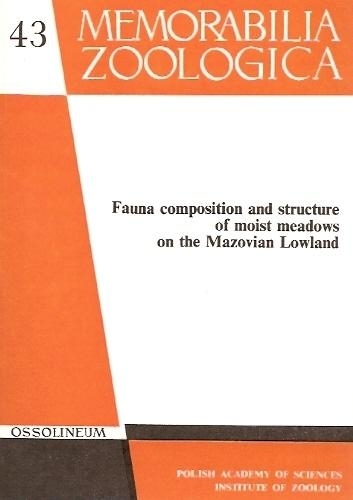 The purpose and scope of zoocoenological studies of moist meadows on the Mazovian Lowland. Stydu area and methods of material collecting on moist meadows on the Mazovian Lowland. Geobotanical characteristics of meadow research sites on the Mazovian Lowland. Earthworms (Lumbricidae) of moist meadows on the Mazovian Lowland. Spiders (Acari) of moist meadows on the Mazovian Lowland. Springtails (Collembola) of moist meadows on the Mazovian Lowland. Grasshoppers (Orthoptera) of moist meadows on the Mazovian Lowland. Leafhoppers (Homoptera, Auchenorrhyncha) of moist meadows on the Mazovian Lowland. Heteroptra of moist meadows on the Mazovian Lowland. Click beetles (Coleoptera, Elaterida) of moist meadows on the Mazovian Lowland. Carabid beetles (Coleoptera, Carabidae) of moist meadows on the Mazovian Lowland. Leaf beetles (Coleoptera, Chrysomelidae) of moist meadows on the Mazovian Lowland. Coccinellidae (Coleoptera) of moist meadows on the Mazovian Lowland. Symphyta (Hymenoptera) of moist meadows on the Mazovian Lowland. Proctotrupoid wasps (Hymenoptera: Proctotrupoidea sensu lato) of moist meadows on the Mazovian Lowland. Chalcioidae (Hymenoptera) of moist meadows on the Mazovian Lowland. Ichneumonidae (Hymenoptera) of moist meadows on the Mazovian Lowland. Braconidae (Hymenoptera) of moist meadows on the Mazovian Lowland. Bees (Apoidea) of moist meadows on the Mazovian Lowland. Predatory Aculeata (Hymenoptera) of moist meadows on the Mazovian Lowland. Noctuids (Lepidoptera, Noctuidae) collected on the moist meadows on the Mazovian Lowland. Nematocera (Diptera) of moist meadows on the Mazovian Lowland. Dolichopodidae (Diptera) of moist meadows on the Mazovian Lowland. Hover flies (Diptera, Syrphidae) of moist meadows on the Mazovian Lowland. Pipunculidae (Diptera) of moist meadows on the Mazovian Lowland. Chloropidae (Diptera) of moist meadows on the Mazovian Lowland. Diptera Acalyptratae (excluding Chloropidae) of moist meadows on the Mazovian Lowland. Structure of fauna of moist meadows on the Mazovian Lowland.